For me, Ramadan in Canada was Ramadan, the only kind of Ramadan I’d known. And yet, it seemed at times like I was being told that there was something less real or authentic about my experience of what Ramadan “felt like,” as if Ramadan as I experienced it was only a substitute for something more real that remained out of my reach. I had come to enjoy and appreciate the serenity of solo suhoors and iftars, and I resented the suggestion that this quiet and introspective approach to the month was only a mediocre replacement for the “real” Ramadan. I’ve been thinking of that over the last few years of not being able to fast because of some health issues (all is good alhamdulillah; fasting just isn’t something I can do right now). When someone asks me how Ramadan is going, I tend to feel a need to clarify that I’m not fasting, and often add that it doesn’t really feel like Ramadan. But that framing makes me uncomfortable. I don’t want to feel like I’m getting a next-best-thing Ramadan, a consolation prize Ramadan, just because I’m not fasting. This is my Ramadan this year, the only kind of Ramadan I can have at the moment. For many people, Ramadan has never meant fasting, because chronic health conditions mean that they have never fasted, and never will. This is entirely in keeping with religious rulings around Ramadan, many of which make it very clear that, for those for whom fasting would be unhealthy, not fasting is not only an option but is in in fact the best option. In other words, this isn’t about opting out of Ramadan; it’s about observing Ramadan in the ways best aligned with one’s body and individual needs. Even so, when Ramadan is almost always defined primarily as a month of fasting, it’s hard not to feel like anything else is at best an inferior substitute. So I’ve been wondering: how do we define Ramadan in a way that encompasses fasting but does not depend on it? I know the usual answers here. Fasting during Ramadan doesn’t only mean fasting from food, for instance; it also means fasting from anger and backbiting and anything else that harms our relationship with the Divine. And Ramadan is supposed to be primarily a month of taqwa, or God-consciousness; fasting is just a means to an end. These reminders help, but they don’t really solve the issue. Even if Ramadan is, in theory, about more than abstaining from food and drink during daylight hours, it is generally defined as a month of fasting, as a time when Muslims around the world are fasting and breaking fast together, and so on. The idea of fasting from other things still starts with the metaphor of fasting from food, assuming the fast from food to be an embodied reminder of the other things from which we should be abstaining, which isn’t true for all of us. It’s hard to focus on the metaphorical dimensions of fasting when discussions about Ramadan and religious events throughout the month are so centred on the literal physical fast. This dilemma was hammered home to me last year when I spoke to the elderly father of a friend, a man who has been incredibly active in his local religious community over the last several decades. He was unable to fast because of a number of health problems, which he told me so much sadness in his voice, adding that he hoped that Allah would forgive him. This from someone who could have been the poster child for exemptions from fasting because of age and health, who had fasted almost every Ramadan of his life, and who was still spending much of his Ramadan in prayer and other forms of worship. His concern about being forgiven, as if he was doing something wrong, stuck with me. Yes, we can say that Ramadan is about taqwa and not only about fasting, but that only really works if we can find ways to highlight other paths to taqwa, not only that of fasting. Since joining the non-fasting Ramadan club, I’ve been struck by the number of people I’m encountering who are also not able to fast. In the past few years, I have spoken to so many people who can’t fast, whether because of pregnancy or nursing, or because of mental or physical health issues. In some cases, these are people I know well, but who didn’t mention they weren’t fasting until I or someone else had also stated that we weren’t fasting. I’m talking from small sample sizes without any actual statistical significance, but it seems like in any group I’ve been in, at least 20% of people there aren’t fasting, sometimes more. In other words, not fasting may be a minority experience, but we’re actually a pretty large minority. It just doesn’t always feel like there’s room to talk about our Ramadan experiences on their own terms, rather than as deviations from the “real” Ramadan experience. When Ramadan is talked about mainly as a month of fasting, the number of people left out of that is actually fairly substantial, even if we don’t count the very large percentage of the population who miss about a week of fasting while on their periods. And this feeling of being left out matters. The reasons that many of us have for not fasting are often very personal and painful in themselves, even before the feeling of disconnection from what can be such a powerful month. When Ramadan is about community for so many people, being excluded from that sense of communal practice can really sting, a feeling I have heard echoed over and over from friends and acquaintances who have talked about dreading Ramadan for this reason. This idea of dreading Ramadan might highlight some of the stakes involved. If this sense of grief and alienation from the supposed “real” experience of Ramadan is so great that people actually come to dread the month, then maybe there needs to be another way to talk about it. Rather than saying Ramadan is a month of fasting, with only a footnote that not everybody fasts or is expected to, I would love to see shifts within the Muslim community as a whole talking about what Ramadan means. Of course this can include fasting for many, but without excluding the fact that for many others, it might never be a month of fasting, and yet it’s still a holy month, even for us. 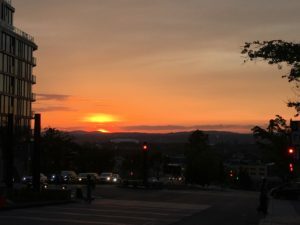 A dramatic sunset I caught while wandering around Quebec City in early Ramadan. One year when I was able to fast, I met up with a non-Muslim friend of mine who I’d known for many years. She was asking about Ramadan and its importance to me, and I found myself comparing it to a kind of retreat, without having to go anywhere. Instead, the act of fasting brought me so far outside of my usual routine that I was able to look at my life from a bit of a distance, examine my habits and the people I spent time with, and think about the choices I made in terms of how I spent my time and energy. It was also a time to push myself towards the personal qualities I hope to deepen in myself and to make a point of spending time on the spiritual practices that hold meaning for me. It’s much harder to find that sense of critical distance from my normal habits and that constant reminder of the sacredness of this month when I’m not fasting. It’s painful when speakers at religious events (or on social media) talk about the blessings of this month when we are “all” fasting, language that suggests that maybe this month’s blessings are less accessible to me and to so many others. I’m still working on finding new paths through this month. I haven’t yet found a way of changing up my routine or engaging in other kinds of rituals that works in the way fasting does. Intellectually, I know it’s not true that Ramadan’s blessings are reserved only for those fasting. I know, even, that there is blessing in eating during Ramadan days for those who need to. I hope that all of us, whether fasting or not, can find ways to talk about this time of year that encompass more experiences so that no one feels that their Ramadan is only a poor substitute for the real thing.